while she observed a fast for Ramzan. One of my earliest food memories of Mumbai from the late 1990s is of going to Mohammed Ali Road to eat during the month of Ramzan. I had read about the food that you get there in local newspapers and told my new friends from the market research agency that I worked in that this is where we should head to. Walking down the narrow roads packed with happy people, eating at stalls selling multi-coloured kebabs and at sweet shops selling gargantuan malpuas was more exciting than anything that I had experienced in my sheltered life till then. I had just moved out of home back then and lapped up every experience back then with the awe of a new born baby. Years later I discovered the wonders of Bohri Mohalla in Mumbai through friends I had made through food blogging and found the fare there to be better than the Minara Masjid stretch in terms of food even though it lacked the festive pomp. By then I was a Mumbaikar myself and felt fully at home at my adopted city. I then blogged about what to eat at Bohri Mohalla during Ramzan. I conducted my first professional food walks there too when I made the transition from being a market researcher agency man to a freelance food guy. These walks then became the foundation of The Travelling Belly, the book I later wrote. Through my writings and the walks I tried to give people a taste, literally, of a life different from their own. So what is the spirit of Iftar all about? This year it struck me that my trips during Ramzan have been all about food and that I have not really delved deep into trying to understand what Ramzan means to those who are observing it. I remembered a blog post that Arva Ahmed, who along with her sister Fairda runs the excellent Frying Pan Adventures food walks in Dubai, had once made about Ramzan. Arva raised the question about whether lavish buffet meals in high end hotels in Dubai are in keeping with the spirit of Ramadan. This is Arva's post on the topic and please read it as it is not fair for me to paraphrase on her behalf but to sum up, she seemed to be of the opinion of wastage and excess possibly does not do justice to the essence and soul of Ramzan or Iftar. This year I wanted to understand what Ramzan and Iftar is all about before making a dash for the promised curries and firnis that the festival promises. I thought of reaching out to my Muslim friends work in advertising agencies or run restaurants or are chefs. They belong to a similar social strata as me and conversing with them would come naturally to me. Then I got the idea to seek answers closer home. I remembered that our cook, Banu, is Muslim and is observing Roza herself. She had told me a couple of days back that she would not be able to taste the food that she cooks to check for salt etc during Ramzan as she fasts during the day. She requested me to check the food while she cooked and tell her if everything is fine. So I went up to Banu, while she was cooking a chicken pulao for my lunch and asked her, "You said that you keep roza (roza rakhte ho). What does this involve?" Banu looked up from her cooking and said, "I fast all day till sundown. I have been doing so since I was a child. Almost everyone in my family does it. My children, my grandchildren. They started observing it when they were seven years old." "We eat a meal before day break to see us through the day. This is called Seheri. My children have roti and milk. I have some tea. Then all day we do not eat. Nor do we drink water. Then we break our fast in the evening. That meal is called Iftar. I can break my fast wherever I am at the appointed hour. At home and outside too. People get together to break their fast on the streets across Bombay. There could be men too but I can join the group even though I am a woman. Later women stay home to say their prayers while men go to the mosque." It was cloudy that afternoon so I asked her, "what about on a day like today? The sun is not visible. Do you still have to wait till the evening?". "We get a card at the beginning of the month from the mosque," said Banu smiling at my question. "It gives the timing for Iftar on each day. As the month proceeds, it become one minute earlier each day as the sun sets faster." "Why do you fast?" I asked her. Market research had taught me to ask 'warm up ' questions first before getting to slightly sticky ones. "Because Allah has asked us to. If Allah, who has given us so much, asks us not to eat then surely we can listen to him. In the beginning he had said one should fast for one whole year. Then the farishte (angels) tried to plead on the behalf of insan (human beings) and said that this was too tough. So it was relaxed to six months and they finally settled on 30 days. "But why do you fast?" I pressed on. "I have been doing it since my childhood except when I am unwell," said Banu. "Anyway we eat so much through the year. We need this. Actually people end up eating more during Ramzan!" she concluded wryly. I decided not to stretch this topic further. It was not for me to analyse her faith or her beliefs or to test her knowledge of spiritual texts. None of that mattered. Finally it all comes down to happiness and I could see that there was a sense of achievement and fulfilment for her in this and not resentment or irritation. She told me that she reads the Quran too during this period. Perhaps if I had delved deeper should we have told me more about her spiritual understanding of what Roza is all about but I decided to ask some of my friends about that later. I wanted to know more about the food related parts from her. "Are you allowed to cook when you fast?" I asked. "Yes," she said and then a bit sheepishly, "but I can't taste the food to check and have to ask you to do so." Then she added, "anyway we do cook at home too even while we fast. We have to prepare food for when we break the fast, so it's fine to cook at work too." Earning a living comes first I guess. "What do you eat when you break your fast at Iftar?" I asked. "We have a date (khajoor) first," said Banu. "Then a banana and then some more fruits. Then water. Having the date prepares our body to take in food after the fast. If we have water straight after not eating all day, our body can't take it." "What about the kebabs at the stalls," I asked. Bandra is full of these after all. "We can't afford to eat outside," said Banu. "Plus the salan (curry) are not good. I make bhajias, pattice, roti at home, pulao too. The children eat it. I barely feel hungry after not eating all day. Khajoor is important though. I also make Rooh Afza (a drink). The family sits together and eats". Banu is a single mother who is very proud of having worked hard to have raised her children. I must confess that I have never spoken much to Banu in all these years. I keep our conversations limited to work related stuff. I work from home and generally prefer to stay in my bubble or zone and do not get into talking about things in general with her. Given a chance she would be happy to talk about her family and health and every little thing with whoever she finds. She is quite the chatterbox and has a ball when my mom in law comes to visit us on weekends or when friends come to stay over. She loves to chat with them. 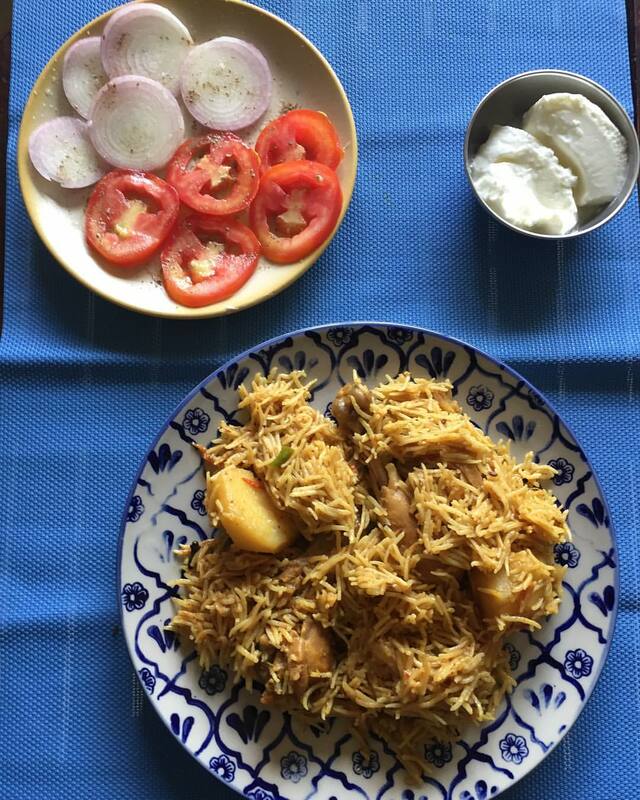 Our discussion on Iftar and Ramzan day symbolises the magic of food to me. The fact that food allows one to connect with people who are different from oneself and to get to know them without being too intrusive. I find it easier to talk to someone about food without being too interfering, or without giving out too much of myself, as compared to talking about money, work, health, love and relationships. What my conversation with Banu told me was that while for us non-Muslims, Ramzan at the most means a time to feast on culinary delights from the community, for those who follow the faith the essence of Ramzan seems to about renewing vows of gratitude to a higher being, of discipline, compassion and of bonding with family, friends and the society at large. I was at the Bangalore airport recently. As is my habit, I picked up local namkeens and biscuits from the airport for family and a couple of close friends here. Then I saw Mysore Pak stacked up there and picked up a small box for Banu. It is a ghee doused sweet and a small amount can fill you up and energise you. It is soft too so doesn't tax you if you are not too hungry. I must confess that this was the first time I picked something for her during a trip. Offering her the box was a small way of taking part in her family's Iftar. A small note of appreciation for all the sheer khurma (a sweet dish also known as sevia) that she has made from home and brought for us during Eid. I had been working on this post for a couple of days then I realised I must publish it today. 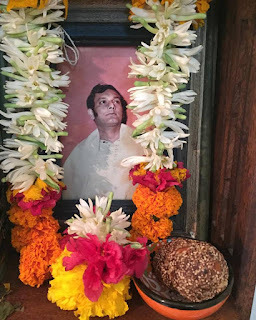 It is my father's death anniversary today and it has been about three and a half decades since he is no more. One of my last memories of him was from when I was 9 years old. My teacher in school had requested him to drop a classmate of mine home as his father wasn't able to come to pick it up. As my friend and I jumped into the car I excitedly said, "daddy daddy this is... (I don't remember his name) and he is Muslim." My father, who always pampered my looked at me sternly for a change and said, "I don't want you to ever refer to people as Muslim or anything else. We are all human beings." Today in a Buddhist study session we discussed the importance of appreciating and respecting diversity to lead to a society that is inclusive, just and at peace. A lesson I had learnt when I was a child and hope I can live up to. Here's wishing Ramzan Mubarak and Ramadan Kareem to all who are observing it. I spoke to a few of my Muslim friends about the significance of Ramzan to them after publishing this post. I am adding in what I have learnt from them. These are the key points and then I will share their quotes verbatim. Ejaz Mirza, market researcher, Dubai: Fasting keeps me humble, makes me generous to the needy and teaches me self control. Zaheer Khan, chef, Gurgaon: Ramzan is an opportunity to practice self restraint and and self accountability and move to a healthier lifestyle. Talha Nazim, advertising professional, Gurgaon: Ramzan teaches you to be grateful for what you have and to empathise with the have nots. and teaches self control. On top of these it is an opportunity to stop/not pause the bad habit..."
"The blessed month of Ramadan is a superb opportunity to practice self-restraint, self-accountability as well as a great chance to shift to lighter meals and find a healthier lifestyle. To beat the hot weather, it is imperative to have the right choice of food during this holy month. Avoiding eating the leftover food from previous night, like fatty, oily, spicy, fried foods. Indulging in a healthy Sehri nourishes, hydrates and strengthens the body to cope with the upcoming fast; it also reduces the dreaded hunger pangs, Iftar is the time to replenish your energy level, while Sehri is meant to give you an energetic start. These days, skipping Sehri is a norm. People generally complain about the lack of sleep or time as an excuse to skip Sehri. Unfortunately, what they don’t realise is that, Sehri is not only good for the mind, body and soul, it is believed that those who partake in Sehri are rewarded with blessings. Preparations for Iftar commence hours before, in homes and at roadside stalls. The fast can be broken by eating dates or drinking water, if the former is not available. In places like Hyderabad, people break their fast with Haleem because it has a rich taste and is quite filling. In southern states such as Tamil Nadu, and Kerala, Muslims break their fast with nonbu kanji a rich, filling rice dish of porridge consistency, cooked for hours with meat and vegetables. This is often served with bonda, bajji, and vadai. Vegetarians of other communities are given a dish called surkumba, which is prepared from milk. It is mainly done in certain parts of Karnataka.In northern states like Delhi, Uttar Pradesh, Madhya Pradesh and West Bengal, Muslims break their fasts with family and friends, with most Mosques also arranging free 'Iftar'. Typically the fast is opened with fresh dates, cut fresh fruits (sometimes served as chaat) and fruit juice along with fried dishes like samosas, pakodas etc. The spread of 'Iftar' can be grand sometimes with dishes varying from vegetarian to non-vegetarian dishes and a variety of juices and sherbets. Iftar usually is a heavy meal and is followed by a light dinner before the night (isha) prayers. Every year during the holy month of Ramadan I take a break from my routine job and I spent one day in mosque kitchen cooking and preparing food for the citizens to break their fast ( Iftar) in mosque. I intend to continue to feed these people every year of Ramadan.Around 400 to 600 meals are provided for people in the mosque." "1. Ramzan is one of the twelve Islamic months. 2. Fasting, according to God in the Qur'an, was prescribed to every religion. 3. Empty your stomach so that you can be filled with God consciousness 4. The Qur'an was first revealed in this month and continued to come in portions for the next 23 odd years. 5. Fasting is 1 of the 5 pillars of Islam obligatory on male and female who have reached puberty. 6. Fasting is a month to change for the better till you reach the next Ramadan and continue in your pursuit to be a better person till you die. 7. Women in period, the sick, children and elderly are excused. 8. Crux = be grateful for what you have and empathise with the have nots"
Not eating and drinking is a very small part of Ramadan, a physical manifestation if you will. The month is about bringing us closer to the people who are less fortunate than us—which is why I don’t believe the month is about feasting at all. After all, the Prophet only broke his fast with dates and water or milk. It's about appreciating our daily plates of food by virtue of staying away from them for a few hours. It’s about sharing those plates of food with those who can’t afford them. It's about setting the tone for a more moderate lifestyle throughout the year. It’s about giving back to the community. It's a month of empathy, generosity, inner reflection and heightened spirituality. It should be a time when we focus on what to serve the lesser privileged rather than on what we will eat for Iftar. If we go through the day brooding over where to go for biryani or struggling between whether to have nihari or haleem for Iftar, I think we’ve missed the point! We're running Iftar walks under the Unseen Trails (unseentrails.com/ramadan) banner with our photography partners, Gulf Photo Plus. These are walks focused on the culture of Ramadan, exploration of one of the oldest neighbourhoods of Dubai, connecting with the blue collar workers of the city, sharing Iftar with them and volunteering to clean up after them. I found the following comment on what Ramzan means to her by Asma Said Khan to be very interesting. She talks about how lonely she felt the first time she was away from home on Ramzan. I could related to that as I felt exactly the same the first time I was away from home on Durga Puja. I remember going to the Durga Puja at Bandra one night after work and then breaking into tears at the thought of how far away I was from home. That's the first time I felt alone in Mumbai. "The Ramzan that is etched in my heart are the summers when I lived in India- I would eat mangoes for Sehri and in the sweltering Calcutta heat- I would wait all day to break my fast with more mangoes! My first Ramzan in Cambridge it snowed and I was trying to cycle back home for iftari and it was too hard so I broke my fast sitting on a park bench with a banana I was carrying in my bag- and I cried! I missed the excitement and laughter and all the wonderful food of my parents table for Iftari. It has been 25 years since I left Calcutta-I always feel lonely breaking my fast without my mother." Asma later started the very popular Darjeeling Express pop ups where she showcases the food of Kolkata in London and now is about to open her restaurant there. She also organises Iftar meals in London. Meanwhile I have become involved with the Durga Puja in Bandra and feel at home when I help in serving the prasad or food to all who comes. It's as much about the rituals for us as it is about the memories and the joy of life is in creating new memories in our pursuit of happiness. PS by KK: In recent years I have seen debates in the Indian social media on whether one should stick to the new trend of wishing 'Ramadan Kareem' (the Arabic way) versus the traditional 'Ramzan Mubarak'. Some of the concerns stem from worries of cultural appropriation and of shifting away from 'Indian' values. I am sure that those who protest feel strongly about the issue. My only submission is to use such festivals to connect with others and wish them well rather than getting last in semantics. As long as no sleight is meant it is fine. Some folks have asked me about whether I will do Ramzan walks at Bohri Mohalla this year. Well, I am not afraid I am not sure yet but here are a couple of posts from the past which could tell you about where to go if you head to Bohri Mohalla and around to eat. 1. Post on eating at Bohri Mohalla from 2011. Most of the places mentioned still exist.